Today registers as one of the strongest momentum days of the week - usually up biased. Taking this seriously. Daily MSP points to a near-term high today AM, which could already be complete. What should have been a reasonably powerful market structure for progress today has shifted probabilities significantly more negative. If a 10:30 AM high takes at the 7:00 AM pre-market highs that could repair some damage. However, a bounce into 10:30 AM (which would be expected) that fails, and especially if its lower than the 7:00 AM highs, would be a sign that momentum today could have inverted and favor further weakness and a close near the lows. So, some mixed signals. 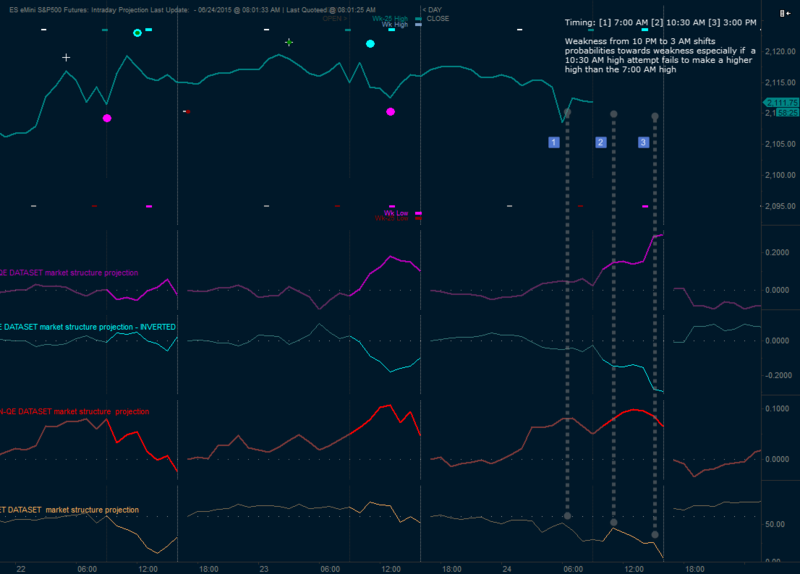 However, also recall, the mcm Index/internals charts posted ( The BIG picture on the mcm Hindenburg Omen – DO NOT TAKE THEM LIGHTLY,  Drama in the Market Seas – a revealing look via the MCM Market Indexes and  Weekly/Daily MSP Probabilities Update). Negatives abound and this is a very dangerous and fragile environment. Below is the updated daily weekly MSP probability bias chart. We are tracking exceptionally well as has been the case for the whole year. A period of sustained down bias appears directly ahead. Top is likely in on a probability basis for a while or there is a moderate possibility that an upward push early next week could be better test. Market is highly precarious. Lots of talk about another Hindenburg Omen yesterday. The mcm Hindenburg Omen did not trigger and though another standard Hindenburg occurred, it's anecdotal at this moment. Below is an update of the mcm Smart Money Index and also the mcm Market Close, mcm Market Open, mcm Gap and mcm Day Session Indexes. 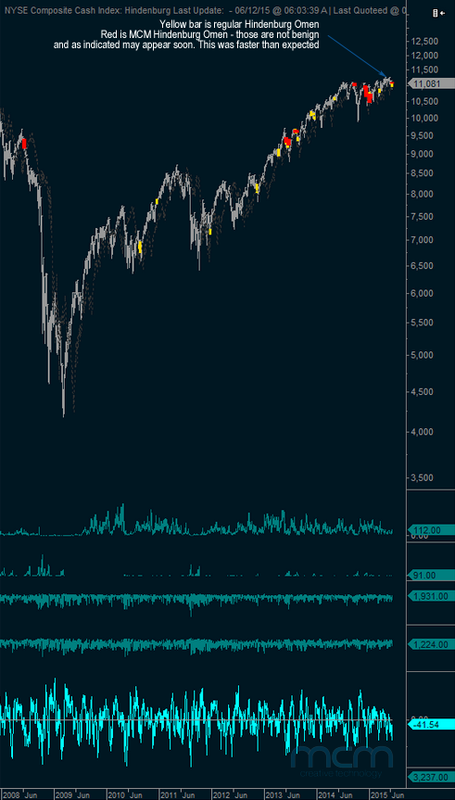 All except the mcm Day Session index have continued to weaken - some dramatically. mcm Gap Index has achieved its blow off as markets attempted to levitate prices via the overnight session, but that has begun failing now too. Very precarious picture putting it nicely. 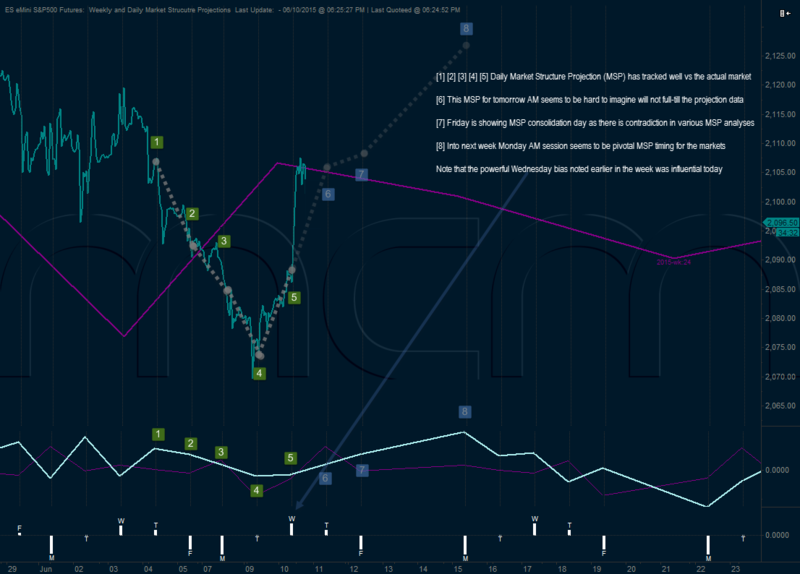 Below are updated daily and weekly market structure projections with extensive notes. 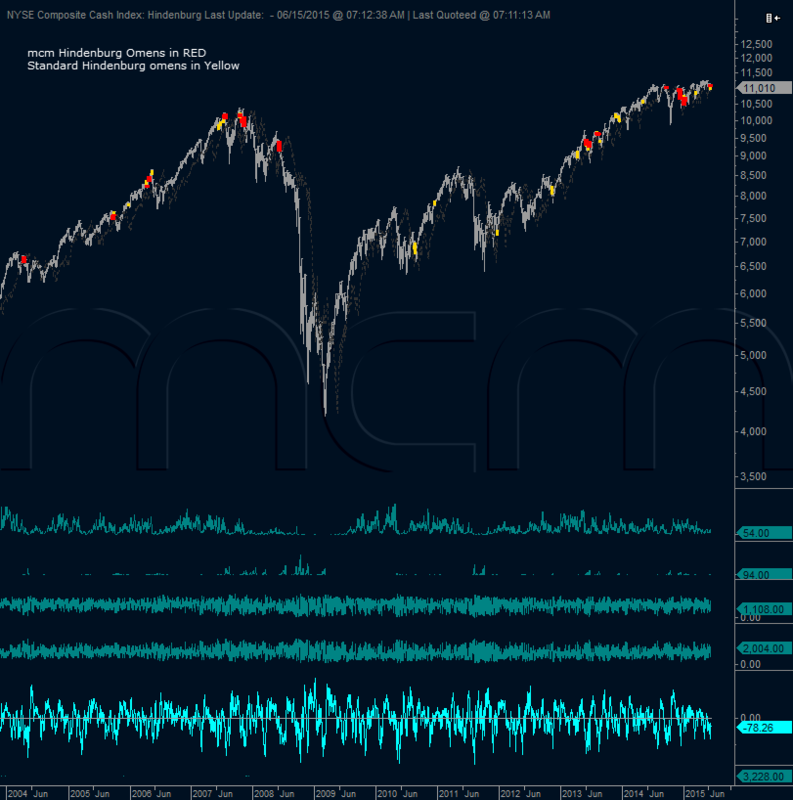 There was an mcm Hindenburg Omen on Thursday last week in addition to highly weak performing bias for Friday and Monday. Comments regarding this potential were made on these pages though we were hoping to see market hold up into Friday or Monday. 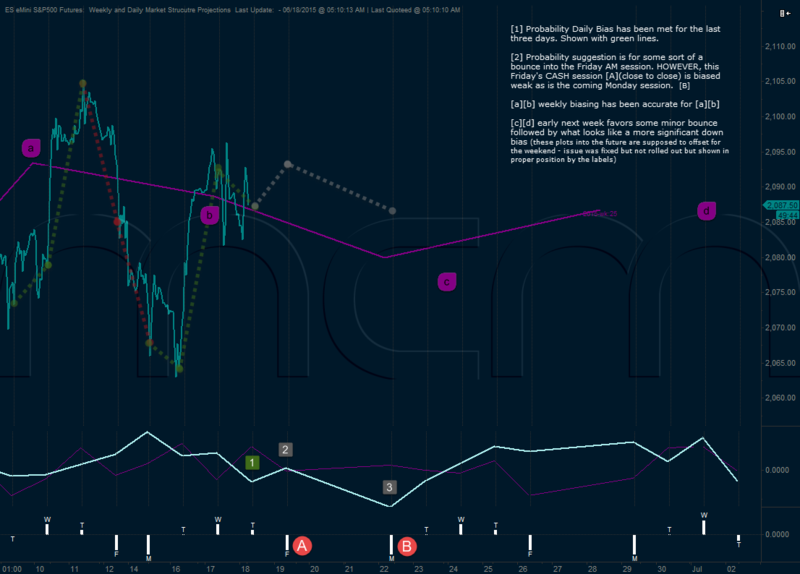 Using our tool set our adaptation for the market true directional probabilities were reassessed each day at around 4 to 5 AM and adjusted correctly for each day. 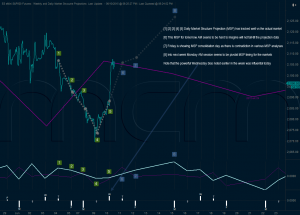 Intraday, market structure has been behaving MUCH more reflective of a bear market tendency which is towards eccentric and unpredictable behavior during the cash session. One comment regarding the potential for positive biases as NOT reflected as high for the near-term. 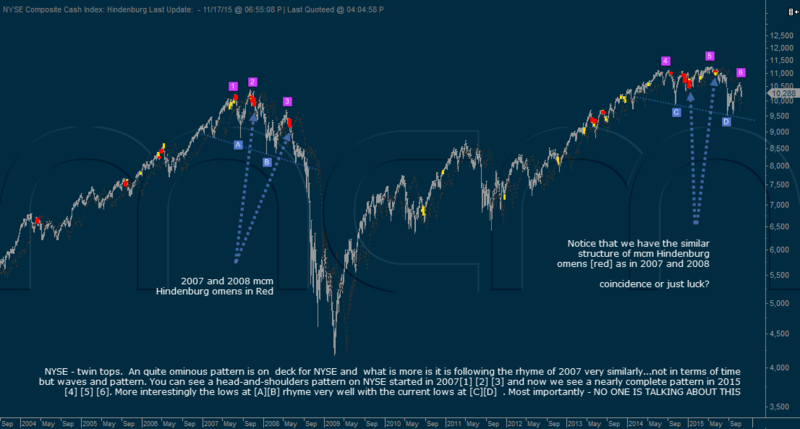 There are lots of Elliott wave labels possible to indicate this or that upward structure. We find EW most helpful but within what fits in the probability skew of projections NOT in what looks pretty or entertaining. Though all market potentials should NEVER be dismissed, it is most common for a change in direction to drag along the previous mentality and preconceptions even for the best analysts. This is one reason that using probabilities reduces emotions. 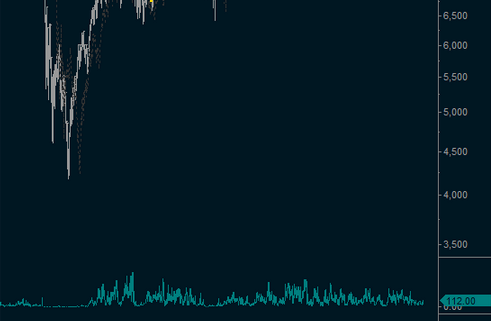 When the markets do something, not within the probability skew - the edge is compromised, and the next fractal for probability needs to be assessed as we have been doing on these pages. This process creates much less wasted energy or effort. Therefore, consider keeping analysis consistent and simplistic at market turning points where emotions, mental, macro analysis can lead to confusion and drag past behavioral expectations forward. 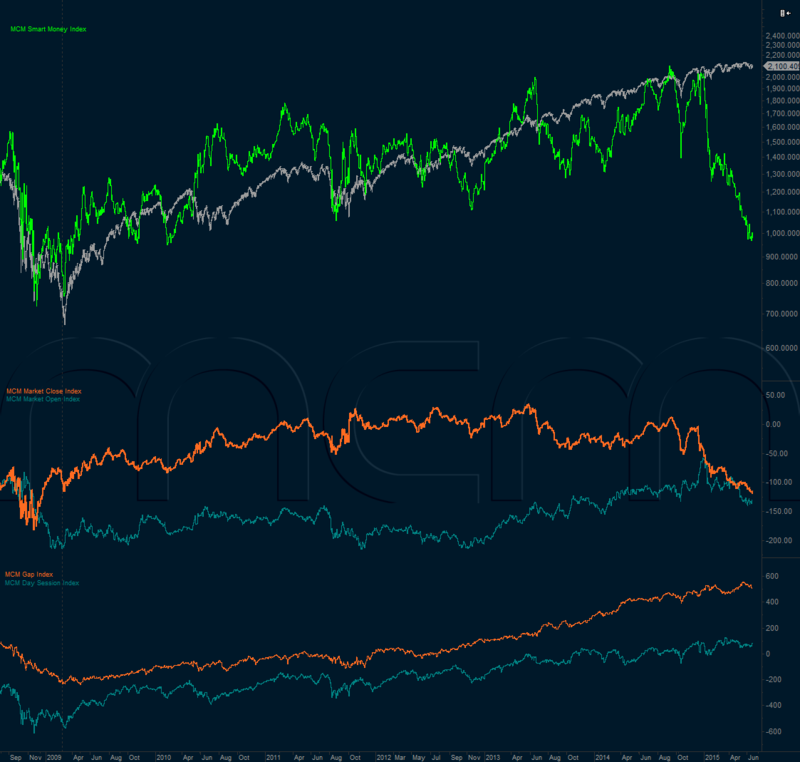 If the weekly market structure projections are correct, then we should start to see markets take on more traditional behavior during the cash session. 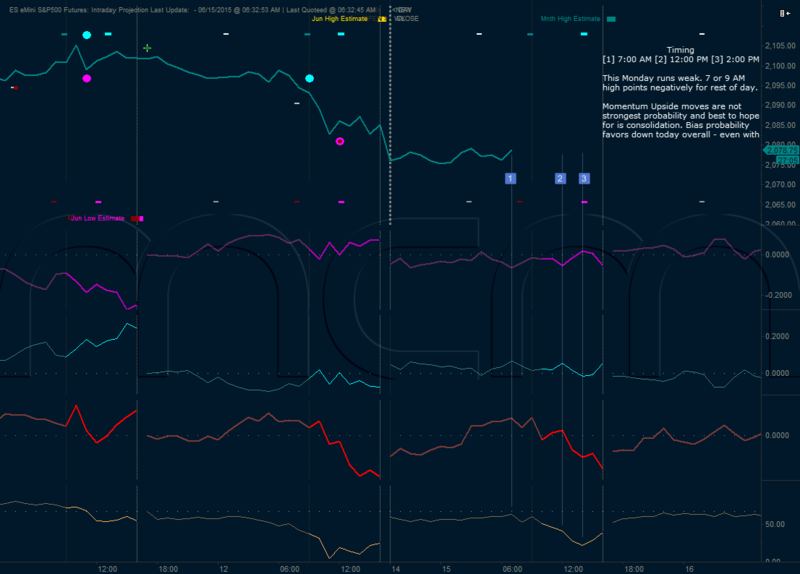 Counter-intuitively is "up biased" for most of the cash session into 12 or 2:00 pm with large down moves overnight into the next cash session trapping bearish traders in the live session. One note regarding what has the potential to become a larger change in character for the markets over the next weeks and months. This has been mentioned previously, but we will reiterate. There is a very high proportion of upwards price bias in strongly down trending markets. 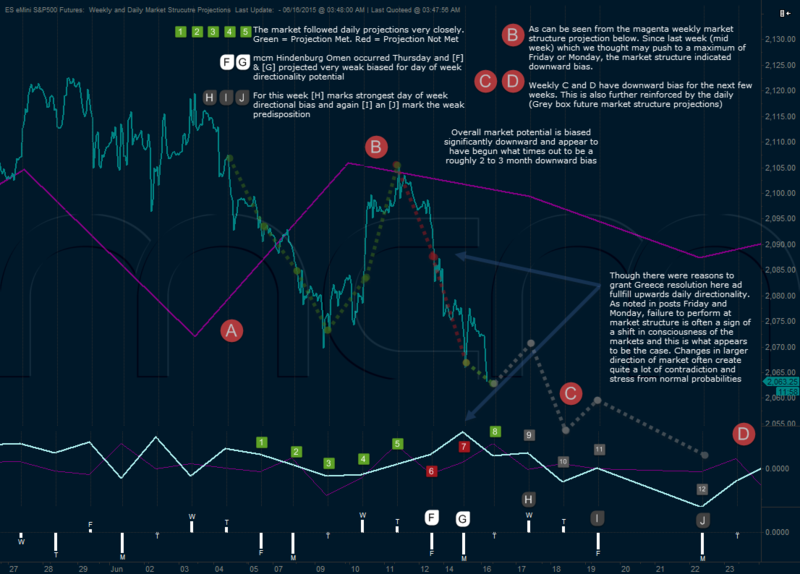 Most of the moves happen before the cash session and trap traders for 5 hours or so before relenting back towards downward potential into the close and in the single digit hours overnight. For reference, we are including the last post for reference. 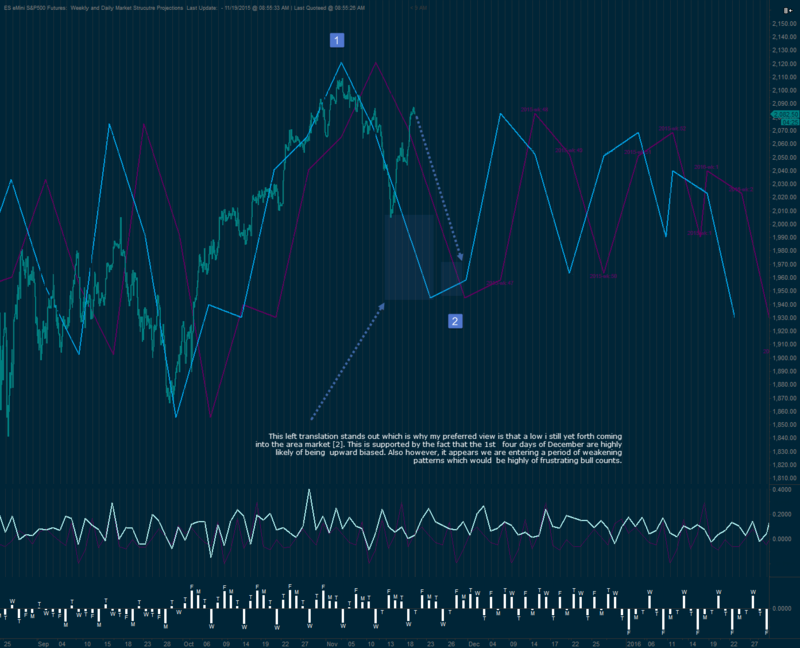 As can be seen nothing changed in the chart and there was quite a lot of valuable data represented on it. 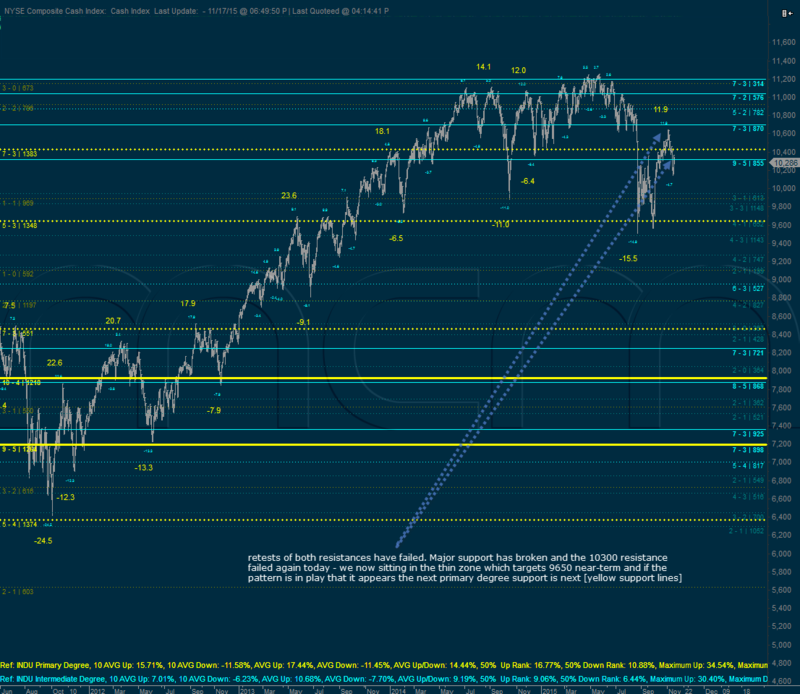 Weekly Market Structure projections turn down this week (ideally mid week). Daily as of today. Friday's and Monday's have a tendency towards weak price action at this time. Markets we so weak that they could not conform to a modest consolidation or up bias into this morning. This is an ominous sign. When markets start deviating in this way, it suggest there is a change of consciousness occurring. Combined with the warning signs we got last week and the mcm Hindenburg Omen - price action has elements in place to get ugly fast. Below is the reconciliation of today's real-time calls. From top down on our Weekly, Daily and finally on the Intraday (shown below) with added data from Emotion, Flow and Gap...there were significant and obvious elements that simply eliminated the low probability outcomes. One note, regarding probability related a Hindenburg Omen. As mentioned in the AM post on the subject, normal Hindenburg Omen's are unreliable and in fact rarely useful. However, as the name implies, there is a tremendous romantic attraction for people to short them...which has the direct effect - even in the rare case that they do work - of going against these traders initially. 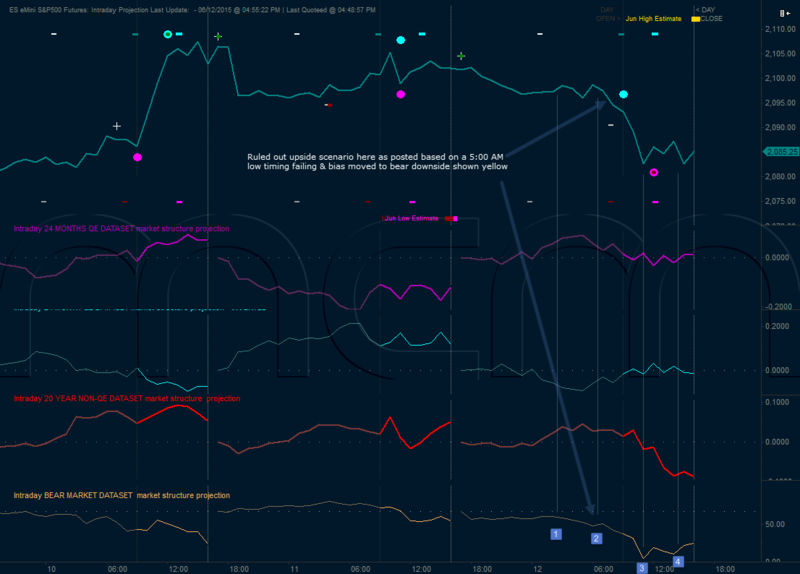 Given that we got a MCM Hindenburg Omen, the implications are much more bearish than normal, however, the nature of the setup is still in play because of the proximity to standard Hindenburg's, which implies that the lowest possible risk entry is to look for the squeeze that usually occurs and also that the market flow data seems to anecdotally support as well. Had a bunch of charts to post this morning, but some internet connectivity problems that slowed things down to a crawl. Will post them later as am on another computer system. The MCM Hindenburg Omen is NOT a noisy, unreliable entertainment vehicle that can be employed to sell subscriptions. It's funny, whenever the word Hindenburg is in any post - traffic for that post goes way up. 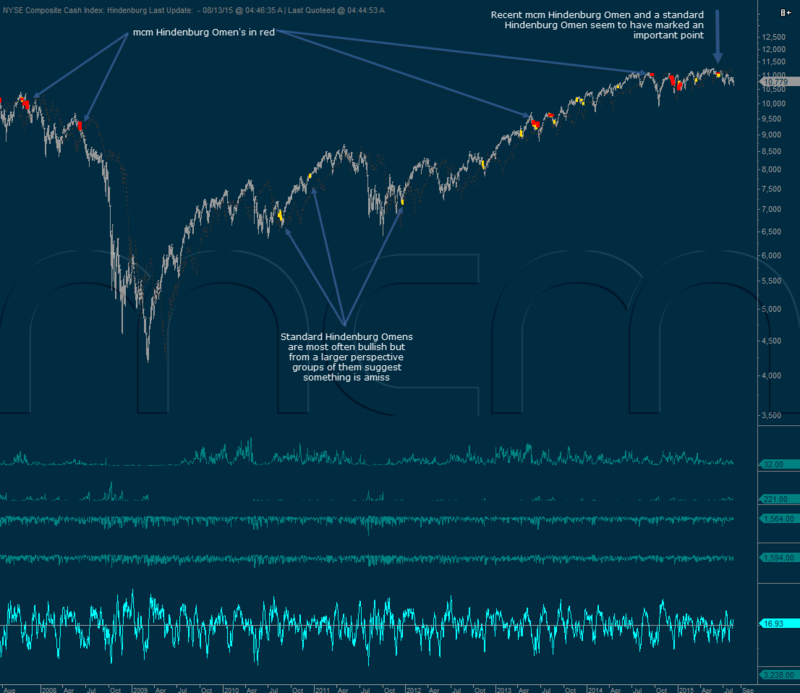 However, Hindenburg Omens are wrong 19 out of 20 times and, therefore, actually useful as a buy signal most of the time. Our tool is much more relevant. It has been designed to produce reliable feedback that fulfills the stated but missed intention of a standard Hindenburg Omen. On the charts, you can see the standard ones marked in yellow and the MCM version marked in Red. 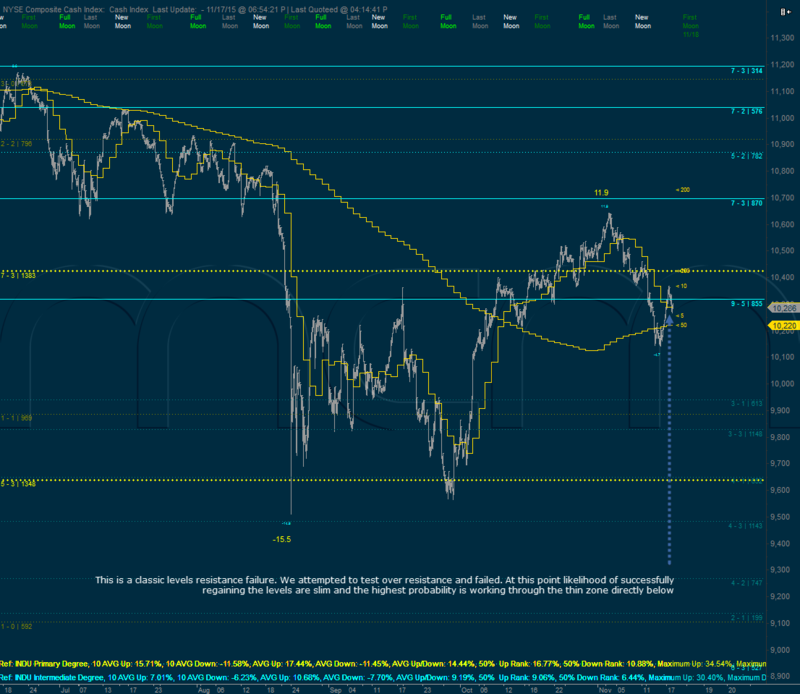 Support over the recent X-Tick held and it does look like the drama will extend over the weekend. Possibly into the Fed schedule early next week. So, the up biased daily market structure is still in play. But it is time to make sure seatbelts are close at hand.